There's something about the sparkle of sunlight on the water that excites me and more often than not I've seen it have the same reaction with salmon. Observing the thousands of salmon captures I've been personally involved in over the last 4 decades I'd say that some form of sunlight was present in at least 85% of these salmon encounters even though most salmon books would have you believe that dull days are best. When a salmon is in the river as a juvenile it is conditioned to expect a hatch of nymphs and flies if there's high pressure or warmth on the surface of the river and studies have proven the relevance of rising barometric pressure and salmon taking behaviour on numerous occasions to confirm this fact. It's not just salmon that are tuned into high/low pressure movement but all other forms of wildlife too. An adult salmon will never deprogram its prior juvenile river conditioning however it will also never lose its ability as a 'prolific' predator either as it returns to the fresh water river environment so do not right off the dull days even though I have less personal faith in them. A fresh run sea liced salmon will still be in full 'predator' mode for at least a few days while it transitions back into its fresh water river mindset and that is why these fresh run fish tend to be much easier to catch regardless of the prevailing river conditions. This fortunate angler travelled all the way from California for a 1 day chance of catching a River Tay salmon on the fly built into his Scottish touring itinerary. Our 'Salmon God smiled for him within 30 minutes of starting that cold dull April day even though I personally didn't like the look of the cold & flat light conditions. This is indeed part of the magic of Scottish salmon fishing and why it is crucial that you maintain positive core thoughts and a consistent and persistent salmon fishing approach to override any negativity that may be off putting. 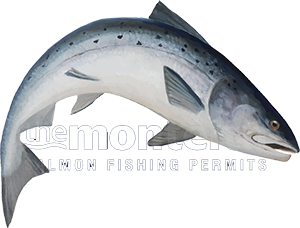 The minute you right off any fishing day in your mind is indeed when you stand little chance of success so always remember that salmon are independent creatures and don't always comply with our thoughts and assessments of them. A fresh run salmon can appear or be present in a pool at any time regardless of the prevailing water or light conditions so stay positive and stay focussed in on the important factors like fly swing spacings and the speed of your fly at all times. There's a great saying that 'you need to be in it to win it' which applies perfectly to this truly magical pursuit.